VANCOUVER, BC – R&B Brewing has announced details of the latest in its Mount Pleasant Limited Release Series, named for the East Vancouver neighbourhood where the brewery has been located since opening in 1997. 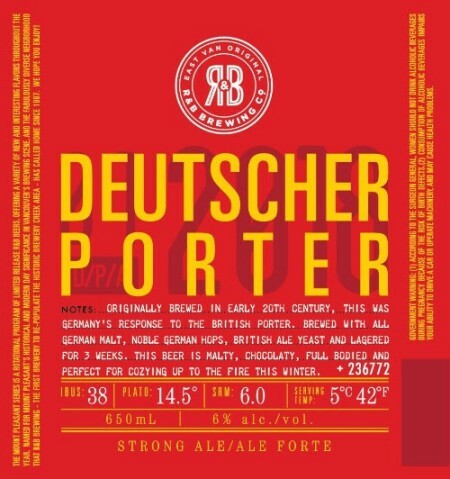 This style of beer was originally brewed in the early 20th Century as Germany’s response to the creation of the British Porter, a style that became popular worldwide. Our version of the style is brewed with all German malt, noble German hops, British Ale yeast and is lagered for three weeks. This allows for the roasty flavours to soften, making this a slightly more sessionable porter than most. This beer is malty, chocolaty, medium bodied and perfect for cozying up to the fire this winter. R&B Deutscher Porter will be available in 650 ml bottles and growlers at R&B, in bottles at private liquor stores, and on tap at select local establishments while supplies last.